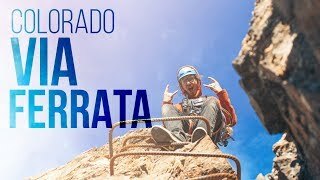 The Mount Evans Via Ferrata is the newest thrilling adventure in the Denver area! 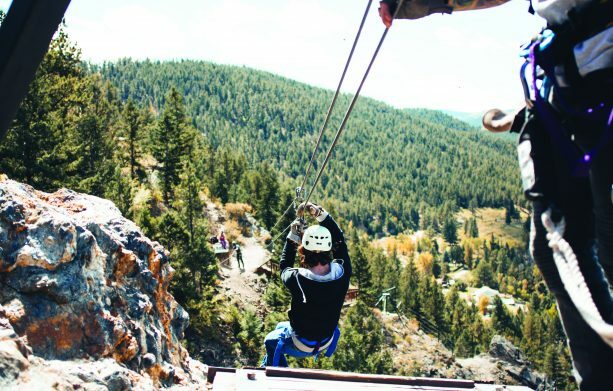 Join us on this 3 hour tour that includes cliff traversing, rappelling, a 50-foot quick fall and ziplining. You will join our experienced guides on the cliffside above Idaho Springs and Chicago Creek for this Colorado via ferrata tour. This experience will test your limits as you traverse across the rock faces. No experience necessary. Moderate to hard physical activity. Meet at our Idaho Springs Outpost for this tour, where we will set you up with via ferrata gear and be on our way to adventure. Via Ferrata, which translates to “iron road” in Italian, is a historical method of climbing and traversing. This traversing method started in the Alps as a collection of protected paths, ladders, rungs, rails, cables and bridges along a rock face. The first via ferratas are thought to have erected in the late 19th century and were popular during World War 1 with the armies of Austria-Hungary and Italy. After the war ended, the routes were neglected and slowly deteriorated. In recent years, a resurgence of via ferratas across the world has brought this way of climbing back to life. Now there are over 300 via ferrata courses around the world, with most residing in Italy, Germany, France, Austria, Slovenia, Switzerland and Spain. Via Ferrata courses have popped up in other Alpine countries, including France and Switzerland, as well as in the United States. The Telluride Via Ferrata in Colorado has grown to be a massively popular attraction. The course is set above the charming town of Telluride in the San Juan Mountains. This exciting adventure offers travelers the experience of the popular European Alps climbing routes. The views on the Telluride Via Ferrata make this a must-do activity, with a bird’s eye view of the town of Telluride, the surrounding mountains and the Bridal Veil Falls.